The California Gold Rush. History of Gold Discovered in California. The first documented discovery of gold in California occurred in January of 1848, when James Marshall found a shiny metal in the tailrace at Sutter’s Mill, a lumber Mill near present day Coloma, California. He brought the metal to John Sutter, the owner of the mill, and the two men tested the metal and confirmed that it was indeed gold. Sutter was initially frustrated with the discovery, concerned that it would attract too many people to the area and affecting his other business ventures. And it certainly did that, as the California Gold Rush became the largest and most famous gold rush in the history of the world. Throughout the summer of 1848, prospectors explored the American River and other nearby areas, and soon found that the rich ground was extensive, with gold scattered throughout the American River and its tributaries. At the time, California was a remote with few inhabitants. It was estimated that there were less than 1000 people in nearby San Francisco, but that soon changed as the prospectors from around the world converged on the area. Within two years the city had an estimated population of over 25,000 people. Many of the miners who were working the ground in the Eastern Gold Belt abandoned their mines in hopes for richer gold country in California. By land and sea, thousands of men from California, Mexico, South America, and just about anywhere else in the world were headed to California’s goldfields to try and get rich. The rush was on. Although the initial discovery happened in 1848, it wasn’t until 1849 when word finally spread around the world and the influx of people really began. The ‘49ers, as they came to be known, first explored the American River area, but soon found that there were extremely rich gold deposits throughout the Sierra Mountains. 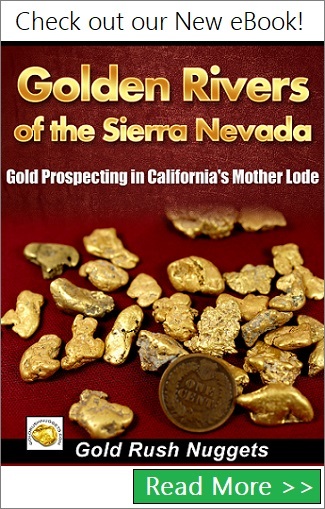 The Feather River also produced huge amounts of placer gold, and within a few years’ prospectors found more rich ground to the north in the Sacramento River drainage. It didn’t take long to confirm that the California Gold Rush was the largest and richest gold discovery in the world up to that point, dwarfing the gold discoveries in the eastern U.S. The expanse of the goldfields was amazing. Thousands of miles of river and streams were prospected in the Mother Lode country, with most yielding at least a little gold. As with all gold discoveries, within a few years the easiest and richest placer grounds were beginning to get worked out. Although placer mining continued on, large mining companies began focusing their efforts on the source of the gold, the valuable lode deposits. Lode sources were identified and extraction began taking place. Other large-scale mining methods like hydraulic mining began operating in full force. This method worked extremely well to release gold from bench gravel deposits that were too difficult to work otherwise. Although hydraulic mining was an efficient way to process a lot of material, the environmental damage that occurred caused serious environmental damage that can still be seen today throughout the California goldfields. Bucket Line Dredges also churned up many of the valley floors, and although they also processed a lot of material, they damaged riparian areas on a large scale. Both methods were eventually outlawed throughout the U.S., but many millions of ounces of gold were recovered using both mining methods. Before the gold rush, California was inhabited by only native tribes, a few settlers, explorers, and fur trappers. By 1849, the state of California was crawling with prospectors, and it established the states as an economic powerhouse in the United States. Mining continued in earnest for many decades, and still continues today, although on a much smaller scale. The state still holds vast mineral resources, yet the hostile environmental and regulatory restrictions on nearly all types of mining today makes mining on a commercial scale quite difficult in California. Nonetheless, there are still rich gold deposits that are yet to be found. The California Gold Rush was the most important gold discovery in the U.S., and was responsible in many ways for opening up the west. Many of the other gold discoveries throughout the west were made by prospectors who came from California to prospect for new gold areas such as Oregon, Idaho, Nevada, Arizona, and Montana.